Earlier this evening I was eating at the table alone, until I noticed I was spilling most of my meal from the plate. The food was disgusting, that’s why. I stopped and dragged myself into a shirt, then the rest of my clothes. The thought of fish and chips floated before me like a fantasy. I picked out my order in my head, could hear the shop’s chatter in my ears. I smiled just thinking of the machine that cuts the lemons, which always gives me something to watch as I eat. As a result of these thoughts I had trouble getting my shoes on. My spirit was too eager, I was not in control. But soon both shoes were on and I marched into the night, swinging my hands, quiet laughs being pulled from of me like nails out of wood. I walked quickly trying to catch up with my spirit which (no matter how fast I walked or ran) seemed always to be striding ten meters ahead. I ran for a while to catch up but I never closed the distance. What happened was this: a car came past and turned, throwing its light into my eyes. This is what made me trip over. I think the light blew a fuse in my interior, something vital to the basic psychology of movement. I tried to catch myself as I went down, but ended up fighting with my own limbs and punching myself in the lips. Something cold and vicious scratched at my face. I landed in mud, my waist propped inside sharp, springy plants. I shut my eyes and lay there until something moved on my face: the wet kiss of an earthworm. When I pulled myself upright I found myself staring at a man sat in front of a campfire. I’d fallen through a gap in the hedge into his garden. The man had both eyes closed. He appeared to be listening to his campfire, and beside him lay a dog with a mysterious, thoughtful expression on its face. Its paws remained tucked beneath its head, which I was thankful for. It just swivelled its eyes up at me momentarily. It was entirely without nerves, I think. It returned to watching the fire, attending to the dog-thought which lay deep inside it and was not accessible to any words. The man waved at me, and I waved back. He was frowning. At that point I recognised him from the shop, where sometimes I went to buy bread. ‘I’m sorry,’ I said. I stood up to leave. Then I hesitated. I had no immediate worries. If anything he had a cosy, round face that was completely non-threatening. (Though of course, it’s hard to work out the true meaning behind a face that is always well-meaning). But in the few seconds we’d had to interact he’d always seemed kind enough. The truth is that this was an uncertain moment – this was not ritual, there were no rules governing the correct behaviour, nothing other than a faint sense of recognition. This is what made me hesitate. He nodded. After a moment passed he said, ‘I am digging a hole for the mirror.’ He held a piece of broken mirror up, a long triangle of shattered glass drinking up the light of the campfire. Then his face turned grey. What caused it I can’t say – perhaps some anxiety that I was going to question the principle of what he was doing, accuse him of living in some fruit-like version of reality. The truth is there’s no difference between the shamanist burial of a broken mirror and the purchase of a high-street placebo. But this way of thinking is scratchy. I’d find it easier to argue with an actual theist. I looked down at the pieces of broken mirror, cut-out shapes of light on the earth. The fire was lacking, so he reached to his right and threw on another piece of wood. Then he placed a shattered piece of mirror in my hand as if to prove it was real. As he did so I had the feeling of forgetting how to speak. I opened my mouth but no words came out. While my speech failed I found myself on a traipse through my own sleeting memory. At the most distant point I discovered a membrane in the ground, and when I stood on it I fell through into a cave. All the time I was stood quite still in front of the fire, holding that piece of broken mirror. Yet I had also fallen through that membrane into a cavity beneath my feet. The cave was a hollow of continuous dark without walls, not even soft walls of darker blackness. Aside from the light falling through the opening, all around me was pure sightlessness. The floor was flat, and air kept whooshing around. I found the gravel underfoot calming. The sound of it beneath me, within this empty space, was all I needed to reassure me, and my body filled with a kind of infinite warmth. By now my eyes had adjusted to the dim, and the light from the opening was reflecting on the space around me. Hanging in the air before me was a misshapen grey form, like a fungal mass. I understood it to be photosensitive. Yet here it was overshadowed by the earthen roof and had become dormant. I examined it further. On the front of the fungal mass was a white circle that looked like a lens, wet with tears or condensation. Hair-like tubers grew across the underside, resembling a frail beard. Apart from this beard and the lens-like shape on its front, the rest of its surface was covered in a series of deep pock-marks, each filled with wet shadow. The whole thing was slowly rotating. It seemed to me it was searching, casting its lens blindly around the darkness. As the words escaped me I found myself above ground, looking once again at the fire, the man with his eyes closed listening to the rustle of the flames. What was the appropriate level of questioning for the remainder of that memory, so weakly present? The man spoke again, now with a slight lisp rippling on the words. The tree branches above began shaking traitorous leaves away. With this my mind brightened. Two big pieces of mirror made a smacking sound when he picked them up. ‘The burial,’ he replied, holding the two pieces of the mirror in one hand and smiling into them both. He stood briefly to offer me a sip from his flask then returned to his seat and said, ‘It’s not for me. It’s my mother, she knows when I lie to her, for that reason I am persisting with this…’ He pulled a piece of paper from his pocket and presented it as evidence – I saw it was covered in large-lettered writing. I said nothing, which seemed to disappoint him. Then he began laying the fragments of mirror on the earth in their broken arrangement. The lines in his forehead knit closer, tying his eyes together. In the distance I heard the threatening sounds of people spilling out of a party. I wanted them to find me, then pictured myself dragging them away from this place. Their voices kept switching around. There were perhaps twenty of them, all reaching after different tones of voice, as if unsure of what type of party it was. Then the volume dropped away – they began vanishing. They’d closed a door and left me with the sound of an aeroplane meandering in the sky. Eventually their voices disappeared into sugary music. I sat next to the man, finding a seat on a rotted log. His dog stood up as if it had been waiting for this sign, and began to scratch away a hole in the ground. Neither of us spoke. I rehearsed the passage of time with my watch. When the hole had opened slightly the man began singing softly, the notes turning like a screwdriver. Without words (but with a very definite physical sensation) I thought ‘I will never catch up with my spirit’. I remembered the feeling of it marching ten meters ahead of me, until my accidental delay. At what point would it sense I was missing – fifty meters? What would it do when it came to that full realisation? Losing yourself this way is a desperate feeling. You could spend forever retracing your steps. The dog is taking its time. I help it dig. I get down on all fours and begin scraping away the earth. I am going nowhere. I imagine myself inside the fish and chip shop – the smell of cod and plaice frying, the sound of people talking, coughing, and so on. I am going nowhere. I stretch the thought into a fantasy, which sustains me as I dig, and in my head I pick out my order, I can almost hear the shop’s chatter ringing inside me, how I will wait in line, pay and sit down, how I like to watch the slices of lemon being cut precisely using a simple machine which comprises only a pulley (for conveying lemons to the blade) and a plastic cog (which spins, flipping them over and over, allowing the blade to cut them into effortless segments). I am going nowhere. This machine, and the repetitive movements of food being wrapped in paper, will give me something interesting to watch while I eat. I am going nowhere. In retrospect what I really wanted was to witness this rhythm, to take part in the simple exchanges at the till – to fill myself up with everything, all of it, not only food, but all of it, the sounds, the company, the people, the cloud of warmth into which I can dissolve totally and anonymously. A kind of infinite warmth. I am going nowhere. Ah, there it is. My spirit ten meters ahead of me ten meters ahead of me. I am going nowhere. 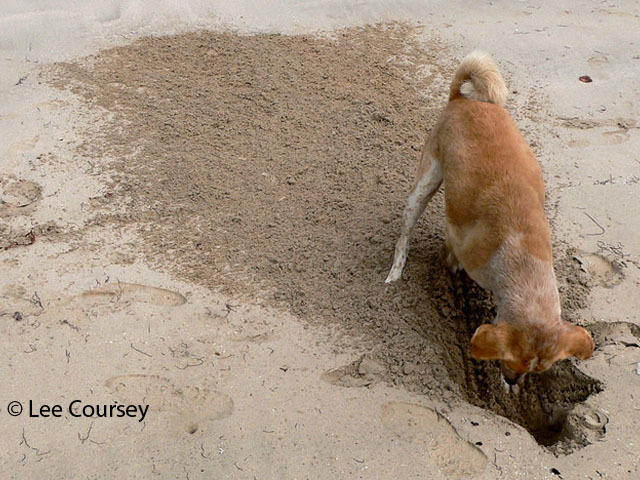 For quite a while I have been digging a hole with this dog.